The weather forecast calls for no giant blobs of jelly, hurrah! 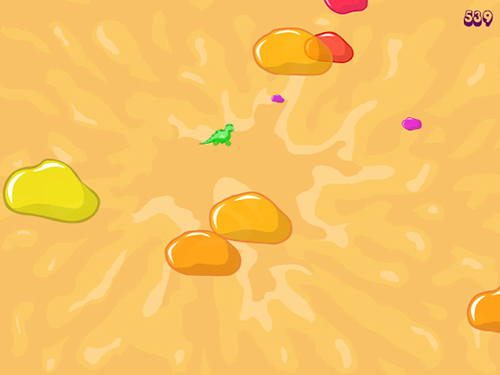 Jelly Blobs of Doom has a really simple set of controls, you just need the arrow keys to move the Jelly Chomby around. But there is a tricky part, our Chomby friend doesn't have great footing, he tends to slide around all over the place. This means that when you hold down a key to move him in a direction and let go, he'll briefly continue to move in that direction. The Chomby can move around anywhere on screen and can even run off the edges to appear directly on the other side. Using these controls, you'll need to guide the Chomby into eating the jelly blobs which are smaller than him to score points. The more jelly you eat, the bigger the Chomby becomes, which means he can eat even bigger blobs of jelly. It's a jelly-eat-jelly world out there! It's not enough to just eat jelly smaller than the Chomby, you're also going to have to avoid getting hit by all the jelly that's bigger than the Chomby. Getting hit by any blob of jelly bigger than you is an instant game over. Some of the blobs will even move faster than the others so you will need to be extra light on your feet if you're to avoid getting eaten. Eating lots of jelly will increase the Chomby's size so that there are fewer jellies bigger than he is, but it will also make him an easier target. The only other end to the game is once you're big enough and manage to eat your first yellow jelly, this is the largest class of jelly excluding the rare blue jelly (see Easter Eggs section below). Eating one of these yellow jellies will take you to a screen saying "You ate all the jelly in jellyworld." Points are earned every time the Chomby manages to eat a blob of jelly smaller than he is. The amount of points earned increases with the size of the jelly blob. As the Chomby begins to get bigger, he'll be able to eat larger blobs for even more points. Some free points to boost your score can be earned by typing the cheat codes fishnegg and rainbownegg once per game. Each will spawn a negg which disappears after a few seconds that can be eaten no matter what size you are. The rainbow negg is worth 20 points and the fish negg gives 50. There are no other bonus points to be earned in this game, so the score you see during the game will be your final score when it ends. There's one really important rule to follow when playing this game; if you're questioning whether a blob is big enough to eat you, the answer is always yes. If you're not sure about whether to try to eat a blob, don't go for it! The game has no time limit, so play it safe, take your time and eat blobs you know you're bigger than. As for moving around the area, try to stay in the center at all times. Try to imagine the border of the game is smaller than it actually is. It's important to avoid the edges because jelly blobs can appear at any moment and rush out to eat you, and because you're so close to where they spawn, you'll have very little time to react. There will be times when there are too many blobs or maybe a really large blue blob moving through the center of the screen and you'll be forced onto the edge; this unfortunately is hard to avoid, so just make sure to move back into the center as soon as it's safe. The Jelly Chomby has a thinner hitbox when facing up or down, use this in tight situations! The game also has a couple secrets/cheats that don't really offer any advantage. Firstly there is a rare blue jelly blob which takes up an incredibly large portion of the screen, but it only appears by hitting any key or multiple keys rapidly in a short space of time. If you're worried you might spawn the blue jelly by accident when playing, it takes about 30-50 key presses within 5 seconds, so you should be fine. Another secret can be found by typing marissa on the "Press the Spacebar to begin." screen which will make the words "(Now are you happy?)" appear at the bottom of the screen.